Fall is headed our way, you can feel the air change but it’s gorgeous, beautiful, and oh so dreamy out! Time to take advantage of the last days of summer and enjoy all the lush green plants before they disappear! So here it is, color of the month August 2011! 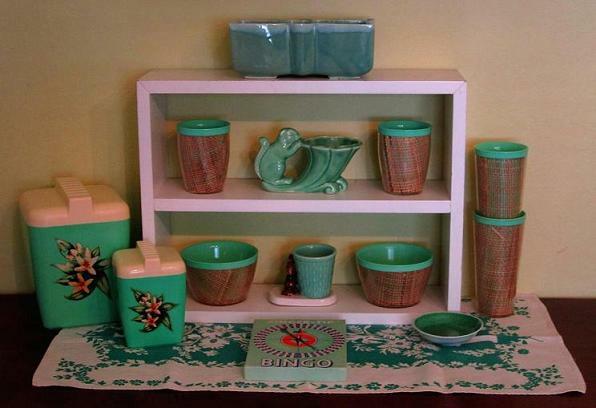 Fave items- adorable minty canisters, the squirrel planters of course, the burlap picnic ware, and fingertip bingo spinner! All anchored by a vintage tea towel as usual! Tea for two this month! My mom snagged this gorgeous tablecloth with dark and minty green for me- nice score mom! 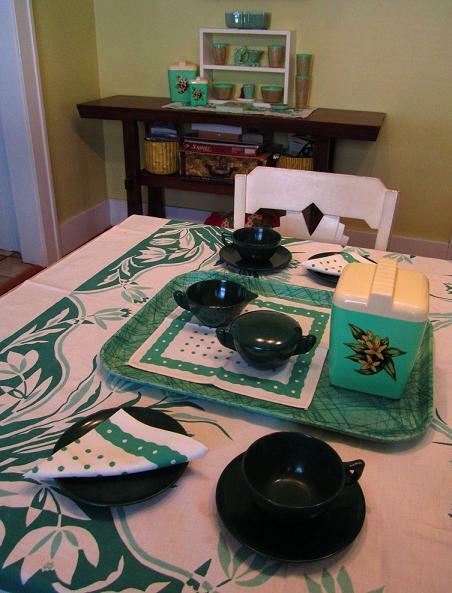 The polka dot napkins make a return and the dark green melmac is Color Flyte by Branchell. Plus tea time wouldn't be quite complete without a canister of cookies! It’s always exciting and a little surreal to see my work show up in a magazine. 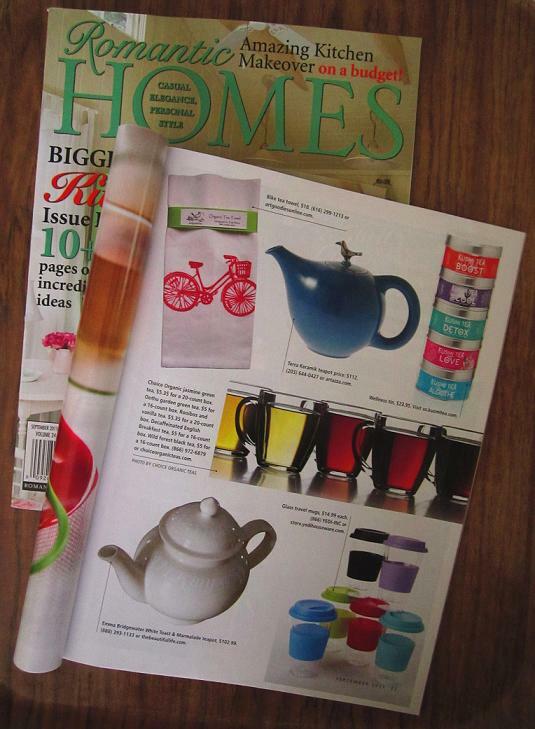 The latest addition to artgoodies press is Romantic Homes Magazine! On page 35 of the September 2011 issue you’ll find my organic bike towel! Lots of people have been asking me about my NY trip, so here’s a quick recap for you all. I’m still digesting the long, busy, and tiring travel week. Luckily we had part of a day before the show to have a bit of time in the city. We headed down to Ground Zero, the church across the street and the 9/11 Memorial Museum. I still can’t seem to find the words. 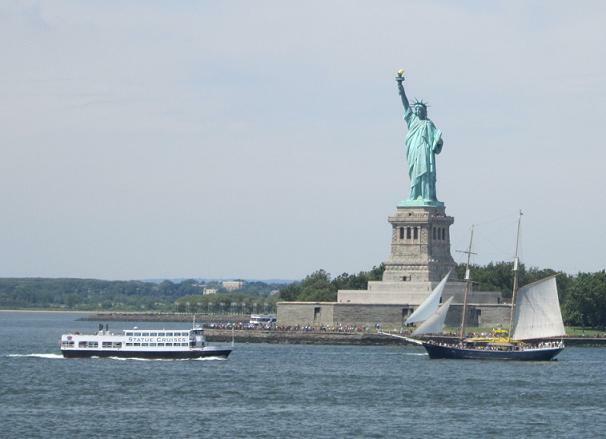 Then we headed off for a ride on the Staten Island Ferry for a glimpse of the Statue or Liberty before we headed back to the show for final set up adjustments. Oh and I have to mention Flavors- a spot that has local organic food- best smoothie ever, go and get a carrot, orange, pineapple one! We stayed in Times Square which is way too touristy for me, but we managed to find a great Thai restaurant a few blocks away and breakfast at Junior’s- you can’t go wrong with a giant cup of coffee, the best marmalade ever, and some old school Jazz in the morning. Plus a piece of Junior’s carrot cake cheesecake to go helped get me through the week. At the very end of the show we caught the Lion King on Broadway, and had a fun time watching a bunch of teenagers run after Lady Gaga. As far as the show, artgoodies picked up some great new accounts, met a few existing ones in person, and talked to lots of magazines! There are a few great opportunities at hand as well. I had some awesome neighbors and it was overall a great experience with tons of brand exposure! The booth build out went great with the help of a couple of awesome hired hands- thanks gals! It was fun to see my whole product line in its own little showroom and my bike towel was also part of the NYIGF sustainability exhibit! Now for the fun part, making product and filling all those orders! 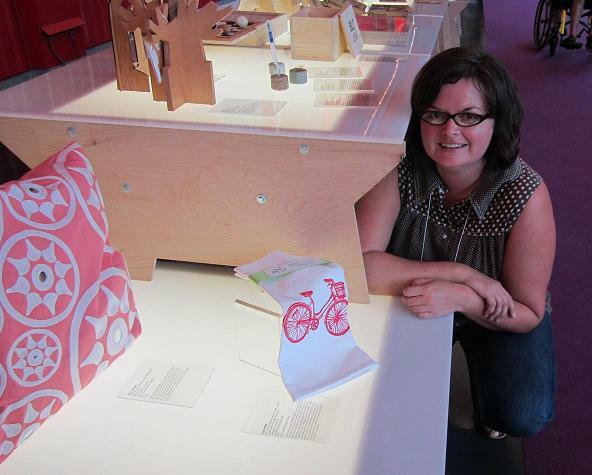 I'm lookin a little tired but excited to have my towel featured in the sustainability exhibit! We, the dazzzling dad and daughter duo, made it to NYC today and installed artgoodies very first NYIGF booth! I’m pretty excited about how it turned out! And I have to say it’s really fun to see my entire product line together in it’s own little showroom! The show opens on the 14th! Wish me luck! 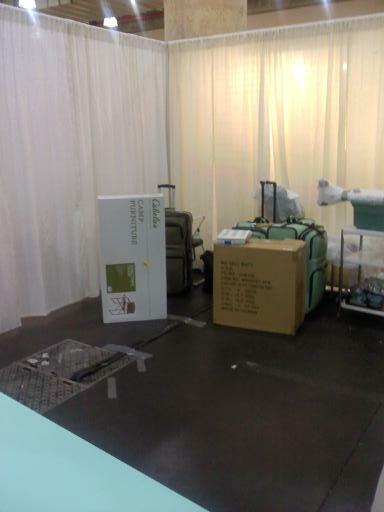 Just for kicks here's a before shot of our booth! What a difference! Another NEW product debuting at the NYIGF next week! 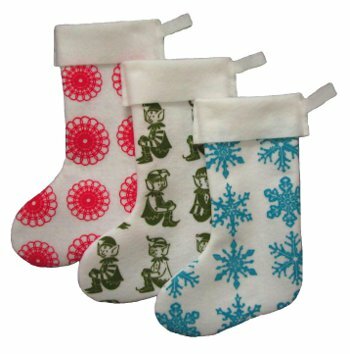 My original hand carved block print has been made into a repeating pattern, then printed on felt made of 100% recycled pop bottles and sewn into a holiday stocking just for you! The NYIGF starts in less than a week! It’s artgoodies very first show! 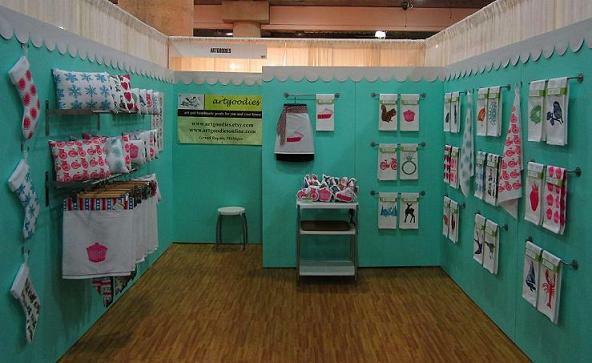 Find me in booth 7877 in the At Home Textile Showcase section! I can’t wait to show you a pic of my booth all set up! You’ve seen a few of these before but here’s a little sneak of the whole new line of artgoodies sham accent pillows! Perfect for home or travel! I’ll certainly be taking one on the road with me so I can make sure I get a good night’s sleep!